Forget napping beneath a tree–Australians could soon be surfing waves on their lunch break in this artificial floating surf park in Melbourne. 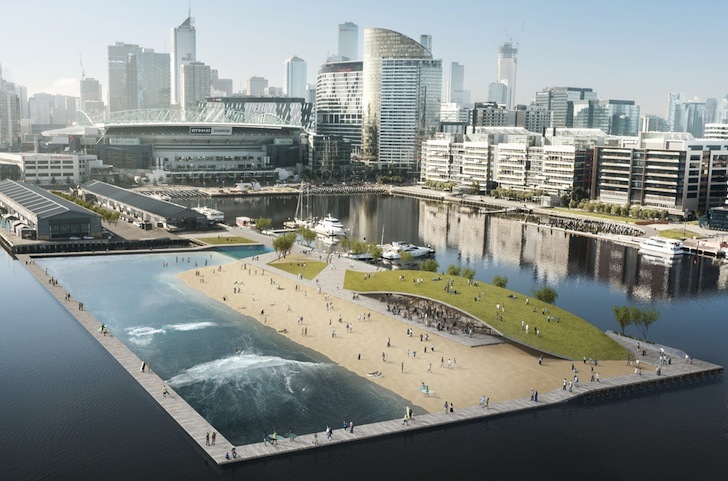 Damian Rogers Architecture and Arup recently unveiled their designs for the Surf Park Docklands, a beach and heated saltwater pool at Docklands Victoria Harbor. The proposed wave pool project would cost at least $8 million to construct and would be complemented by a green-roofed recreational facility and boardwalk. Since the closest surf beach to Melbourne is currently a 30-minute drive away, architect and surfer Damian Rogers saw an opportunity to bring the sport closer to home. Thus, his proposed floating surf park is located just off the end of Melbourne’s Docklands Central Pier. The conceptual wave pool is capable of creating three- to five-feet-high, man-made waves from filtered and heated saltwater drawn from the surrounding harbor. The size of those waves can be adjusted to suit user groups of all skill levels. Related: Rotterdam is Transforming a Canal into a Water-Purifying Wave Park! 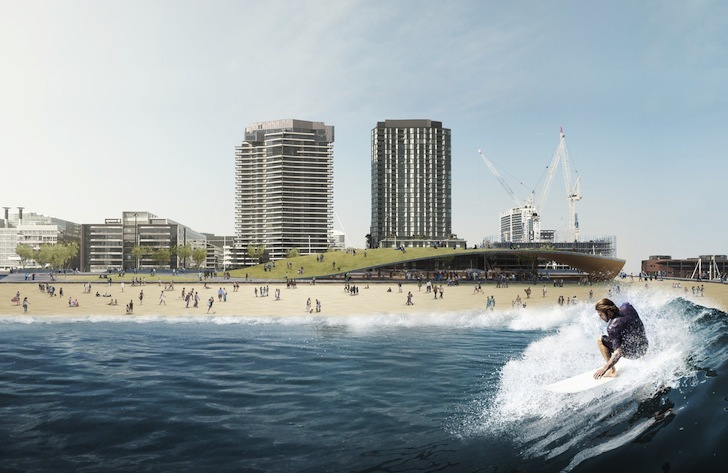 Damian Rogers Architecture and Arup recently unveiled their designs for the Surf Park Docklands, a beach and heated saltwater pool at Docklands Victoria Harbor. The proposed wave pool project would cost at least $8 million to construct and would be complemented by a green-roofed recreational facility and boardwalk. The City of Melbourne has yet to commit any support to the project, but has said, "It was an interesting concept, if private funding were available for the infrastructure."